Having completed some chores, like lashing my sidelight box into the rigging, it was definitely time to move on. One problem: getting back up the Manatee River. When the wind has blown at all, it has blown straight down the river. 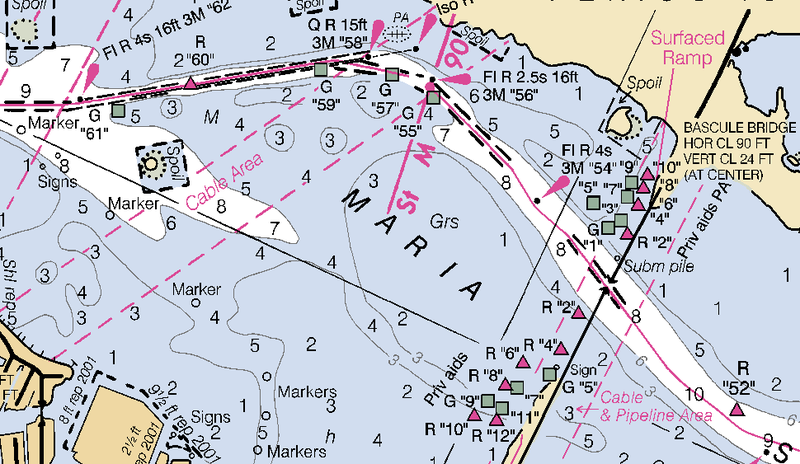 Not only does this make it difficult to beat out of the river, it has made the anchorage darn uncomfortable at times. When I looked at this photo, I thought to myself, "No wonder I'm covered with black and blue marks! I gotta get out of here!" It's funny how you can suddenly 'see' something in a photo that you have been staring at with your naked eyes... Ain't the human brain odd? Anyway, it was clear that getting out of the Manatee River and moving on to my next stop would take some planning. I haven't mentioned my engine problems, yet. The Blue Moon came with a 16hp outboard motor. It seemed to run well enough at first, and it still starts easily, but for the last few days, it has only run well at low power. As soon as you give it some gas, it stalls out. Not good for getting in and out of sticky places like inlets and wind-blown anchorages. In fact, the engine did not have enough oumph to power out of the anchorage above. I know, because I tried. 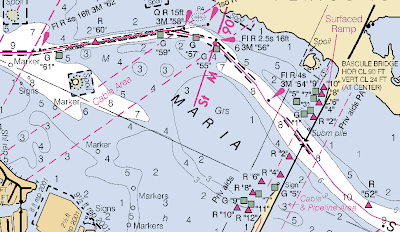 In puzzling over what to do next, I started looking at the Intercoastal Waterway (ICW), that provides an inside passage all the way south from Tampa. I started talking to other sailors who I met at the marina (amazing the conversations you can strike up while doing laundry! ), about the ICW, and whether a boat like mine could make it through. Universally, everyone said "Of course you can make it through!" But looking at a chart, I had two worries: 1) it looked like I'd have to motor a lot, which was problematical with my cranky engine and 2) the ICW is criss-crossed with bridges that are too low for a sailboat to cruise under. There are no such bridges on Long Island Sound, so I had absolutely no experience with opening bridges. After going back and forth on this question for a couple days, I finally decided to try the ICW for the best reason of all: I'd never been on it before, and new experiences is the whole point of this trip. So last night, I set my alarm for 05:30, when I expected the wind to be minimal, and lifted anchor as soon as I could make out the markers in the pre-dawn light. There was no wind and the tide was slack, so I was able to make a crisp 3 knots up the river and was on Tampa Bay in a bit more than an hour. What is a 'bascule bridge'? What am I doing taking a picture, instead of moving briskly through the opening? After taking this photo, I realized I should have been moving towards the bridge, rather than fiddling with my phone, so I gave the engine a bit more gas and headed in. Bad idea! Just as I was entering the bridge opening, my engine stalled. Luckily, by then the other boats had passed through, so I had the whole opening to myself as leaned over the back of the boat to restart the engine. Adventure spirit aside, I seriously started thinking about doing something about that engine. This initial thought was reinforced after talking to my uncle Marty on the phone at lunch time. If anyone is responsible for my boat building/sailing adventures, it's probably Marty. He emigrated as a sail maker from Germany around 1960, married my mother's sister, and got my father -- and me -- into sailing. He has a vast well of experience to draw from, and after hearing my engine laments, urged me to get it looked at, ASAP. I resolved to do so. Luckily, for most of the afternoon, I was able to sail down the broad waterway, leading to Sarasota Bay, thus sparing my engine (and me!) any more abuse. I even had a little race with another boat heading down Sarasota Bay. Even flying just the big main sail, the Blue Moon kept up with this production sailboat for quite a long time. We sailed all the way into Sarasota, under the big new Ringling Bridge (named after the circus family, that had it's headquarters in Sarasota for many years), and right into the anchorage, just south east of the bridge. We came to anchor without firing up the engine at all, all afternoon. Now that's the kind of sailing I like. And overall, I'd say my first day on the ICW was a big success. Much easier, and more enjoyable than I'd expected. I'll be using it more in the future, but my next priority is to get that engine fixed. Good idea, John, to let someone fix your motor ASAP! If something serious comes up and you don't have motorpower you could lose your boat. You don't have an outboard just for fun. engine problem sounds like limited fuel flow. partly blocked fuel filter? I recall my first time seeking a bridge to move (in Norfolk).....I was VERY concerned.....and have had to ask tenders to wait as my little engine could not push the boat fast enough to get through as he thoughts I should. Glad you are doing the ICW.....not a place to sail (mostly.....90% mostly)...but fun. Also have had engine trouble coming down the ICW from VA to Nc and causes much consternation as it peters out at the time you really seem to need it. i feel for you my friend; BUT sounds like you are having an amazing time! Sounds like your due for a parrot head type of a break. Hit the beach get some R&R - fix the motor drink some rum eat a lb or 2 of shrimp. New plugs w/proper gap , new or clean fuel filter, check hose and tank for junk, remove and clean carb with spray stuff. Easy stuff for about $15 Might help ? ps we want more pics - motion pictures - live streaming feeds - interviews with the natives - gps tracking & maping updates - fish stories - sea monster sightings - shore expedition reports. ha ha just kidding. Thanks for sharing the salt, sand and wind ! Before you get too worried about the engine, try opening the cap on the fuel tank a bit- it sounds like a plugged vent which may be causing a bit of vaccuum, prevent full fuel passage. If that doesn't solve the problem, work your way upstream and check the filter, and the bulb for obstructions. If that doesn't solve the problem, you likely have a vaccuum leak at the intake, causing the engine to get too much air after the carb, which will cause it to bog and cut out. The more trouble shooting you do yourself the less time and money you have to spend at a repair shop. Sounds like you may be suffering from the ethanol gremlins. You should have a micron filter on your fuel line. Ethanol separates over time in an outboard tank and water doesn't combust like gasoline. Doesn't happen in cars as we use it up too fast and refuel. The fine filter will remove the water. I think bljones might be on to something. I had a similar vapor lock problem with an old outboard years back. engine started like a champ, ran well at idle, but as soon as you try to give it an juice, it would die. loosen the fuel cap then give it more throttle. If it works, suggest not running with the cap loose, replace it, or replace the entire can. fuel leaks are not your friend. I also agree with Uncle Marty, you shouldn't pull up anchor until that motor will run smoothly and reliably at full throttle. Really enjoying the blog. Looks like all you needed was a little engine trouble to get everyone to come out of the woodwork with comments. Thanks for all the comments and ideas, guys. Unfortunately, engines are one of my many weak spots... I don't know much about them. But I did try some of the ideas mentioned here, such as making sure the vent was open, and seeing if it ran any better with the choke out a little. While learning how this outboard works is definitely on my to-do list, at the moment my main concern is to get going again quickly, so I'm going to get some professional help. The engine itself is an obscure make -- Bombardier. Not every outboard guy will work on them. Luckily, there is a Bombardier service place on Sarasota Bay, so I've brought it to them. Of course, it is the weekend, so now I am just waiting for Monday. The preliminary diagnosis is that it needs a carburetor rebuild, but I'll find out for sure on Monday. Thanks for all the interest. I'll let you know what happens.